I decided to get my hair cut a little shorter a few weeks ago--sort of a layered, edgy bob--without being too edgy, because change is something I need to do gradually! My new profile picture shows the new 'do. I have a closet full of hair products and tools, but of course I couldn't seem to replicate the look I was going for with any of them. I started using a combination of Redken Wax Blast and Goody's Pro Root Lifter Comb for Volume, and I'm pretty satisfied with the results. 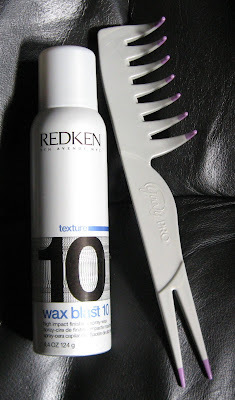 Wax Blast is a spray on product that gives my hair just enough hold without any stiffness. After I've blow dried and flat ironed my hair, I spray this product on. Be warned though, it has a very heavy scent, but thankfully it doesn't linger. 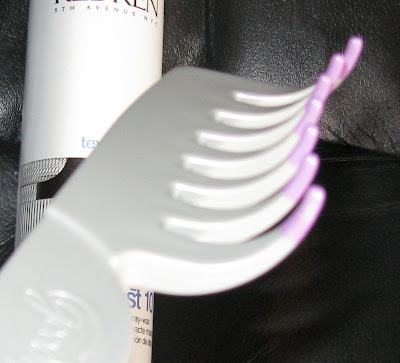 I then use the Goody comb and because of the way it's curved, it allows me to lift sections up a little for volume. I don't like to back comb my hair for volume, because I think that's a little damaging to my fine hair. I've tried flipping my head upside down after spraying with the Wax Blast, but then all of my hair is massively volumized--much too much! This comb allows me to target the areas that need a boost without disturbing the sections that are already behaving properly. The Wax Blast is a great product, as it allows me to twist or piece the ends, volumize the crown area, and gives my hair overall hold. It doesn't feel waxy or heavy, which is always a plus. My hair seems to have more texture and dimension when I use this, and the spray is very fine resulting in an even application. It retails for about $14.00 for a 4.4 oz. can, and can be purchased at Redken Salons and various online e-tailers. (I ordered mine from Sleekhair.com). The Goody Root Lifter Comb is perfect for this cut and my hair type (fine), as it allows me to lift just the right areas that need more volume. The deep curve means I'm lifting at the root with the teeth without lifting the surrounding hair or the ends. This retails for about $4.00 at various chain drug stores (I picked mine up at Meijer). The winner in yesterday's mini China Glaze giveaway is Carolina! Enjoy your Peace on Earth polish and stay tuned because we'll be giving away more shades from this collection! In a totally off-topic note, Happy Birthday to my husband today! I bought him a cordless impact driver--hey, if that doesn't say I love you, I don't know what does! Ha-ha, it's what he wanted so if that's what makes him happy, right? And it's very cool that I have a BB Couture polish in his name (Michael) and of course the one named Impact Driver! I'm chopping my hair off today! Goody has really been coming out with some great products lately! Happy Birthday to your husband Mary. Nice to have my favorite brand of polish have 2 polishes for your husbands name and tool! I sure do love the new hair do! I also love that Goody product. I'll have to look for it. Congratulations to Carolina. Have a nice weekend everyone. I noticed right off that you had a new photo up and adored the new style. It sounds like you have the same texture of hair as I do. When you use the Goody comb, is that when you are blow-drying it or spraying it with Wax Blast? Didn't know it was your husband's birthday, Happy Birthday to a very lucky man. Your new hair style is very glamorous. Love the way the back is feathered and styled like a pixie cut. What can I say About hair, LOL I know nothing except what I can see is a very beautiful and lovely young lady with great looking nails. Kudos.